I love glass bottles. I would use glass exclusively in my house if it wasn’t for the breaking factor. I was excited to find Glasstic Shatterproof Water Bottles just for that reason. They have taken a glass water bottle and encased it inside a heavy-duty plastic with the buffer of air between them so that it is shatterproof. Brilliant! In today’s world we all need to get smarter about the products we choose to use, and using disposable bottles for water is just adding a huge burden on our landfills, if we all could find that perfect bottle this summer to refill whenever we were thirsty, we could save so much room. I love that Glasstic puts the great qualities of glass together with plastic to make it portable and safer to use around the house and out and about. I have traveled all over the city with this bottle since they sent it to me and I have even dropped it once, and I must tell you I was a little nervous, but no damage! When you realize that U.S. landfills are overflowing with 2 million tons of discarded water bottles alone, it makes you rethink how you are drinking your water. It is not a small problem, only 1 in 5 water bottles are recycled, and that leaves an awful lot of bottles just sitting around our world. When Glasstic began to develop a better refillable water bottle, they knew they wanted it to be glass, but they also knew it was going to be hard for people to take them on the go with them. There also is that rule on many beaches, gyms, parks and even schools where there is no glass allowed, so had to come up with a solution where they could use glass but take out the breakable factor. So, with all of this information I had to ask the question, what are the benefits of drinking out of glass? The first thing is glass is 100% recyclable, you never have to worry about BPA, and you don’t have to worry about heavy metals that can leach from metal bottles. I also find that with stainless steel bottles I get a slight metallic taste. My husband likes the metal bottles, but I prefer the glass over anything else. 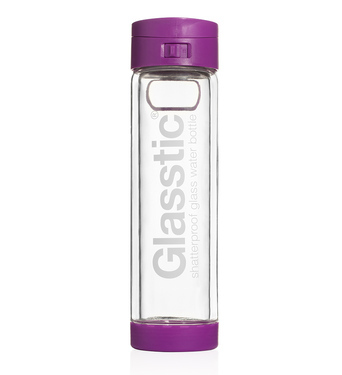 I love this Glasstic Water bottle, I take filtered water out of my fridge and fill it up, I find I drink more water this way and I know it’s better for me and better for the environment. You can purchase your own Glasstic Shatterproof Bottle at their website and if you use code REV15OFF you will get 15% off of your purchase. Connect with Glasstic on Facebook, Twitter, Instagram and Pinterest, and keep an eye out for their new products and specials. You can also win your own Glasstic Bottle here on our Swinging into Summer Giveaway starting June 1st! These are nice. I would really love to one.